You are bidding on 1 New Air Force Rank Insignia decal. Size is 4". These are blue with a white background. They will stand out on tinted or non-tinted windows. I am showing 2 different decals, E-8, Senior Master Sergeant. During paypal checkout leave a message choosing which decal you want or send an email. I will NOT ship until you tell me which rank you want. 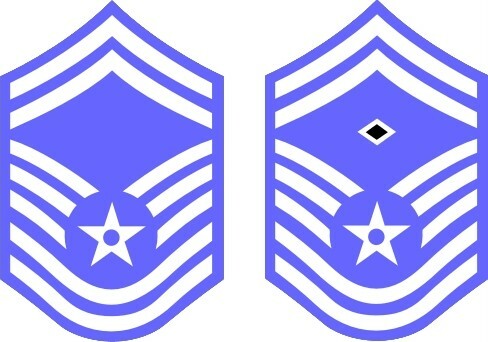 Also if you want the rank insignia with Retired below it, let me know and I will include it for no charge. (Blue color). The red line around the image marks the outer edge but is NOT part of the decal. The decals are all high quality made for outdoors. I guarantee all my items. If you get something defective I will replace it or refund your bid. See my feedback. FREE SHIPPING! Outside US is $2.50 additional. I have other Sizes & other Military decals available but not listed (all services). If yours is not listed email me. Also do custom designs. I prefer paypal. And ship upon payment. See my other items. Any questions email shoplakeland@aol.com. Thank you for your bid.